Bake a sheet cake the size that you need. Cut out the number one shape. To do the collage, I just took a lot of pictures of the baby, cut them out and arranged them on a rectangle shaped piece of paper that I cut to fit the center of the first birthday cake. I then laminated it on both sides with the self stick laminating sheets. Next, ice the top of the cake with white icing using a cake spatula. Let this set completely for about twenty minutes. Now lay the laminated collage in the center of the cake. You can use the colors you want. This cake was done in red, white and blue. With white icing and the same size star tip, make a shell border around the collage and the bottom of the sides of the cake. When you cut the cake, just lift off the collage starting at the corner and you will have icing underneath. 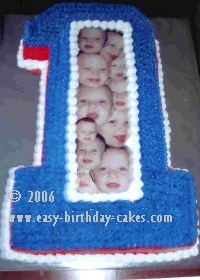 To see more first birthday cakes . . .
Share Your First Birthday Cake! If you have made a first birthday cake that you would like to share, please submit your cake here and let us know how you made it! We would love to feature your cake on our site. Please make sure to include a photo of your cake and a description of how you made it, so that we can all share ideas and learn from each other! See First Birthday Cakes That Were Submitted By Others To This Site!